The National Citizens Alliance believes that the welfare state is preventing the Canadian people from attaining their greatest prosperity and security. The welfare state creates dependency by the Canadian people on government handouts, and results in higher taxes and more regulation. This system of government is highly inefficient and ineffective, and consequently, is putting the future of the Canadian people and country in jeopardy. The federal debt is an indicator of this inefficiency and ineffectiveness. The debt continues to grow, surpassing $657 billion, with over $30 billion a year in debt service payouts of our tax dollars to commercial banks. In addition, the federal government spends for example around $24 billion a year of our tax dollars on immigration and refugees (not including over $40 billion immigrant taxation negative), and the path to citizenship has been fast tracked to 2 years for refugees. Further, the federal government spends around $280 billion a year on all forms of welfare handouts. The National Citizens Alliance supports efficient and effective government and true service of the Canadian people, which includes fiscal responsibility with the people’s money. We support restructuring the welfare state, so that it works for all Canadians and most importantly those Canadians in true need. Our future as a country depends on it. The National Citizens Alliance believes that Canada requires a major restructure in order ensure the prosperity and security of future generations. 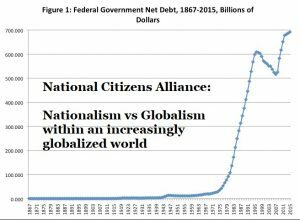 The massive federal welfare state is not financially sustainable as demonstrated by the growing high federal and national debts. Although the transition to a more efficient and effective system of government premised on greater independence of the Canadian people will be difficult for some Canadians, the structural transition is integral to the future prosperity and security of the Canadian people and Canada. The Restructure the Welfare State policy statement requires a vote of the NCA membership to be adopted. A minimum 70 percent voting membership must support the policy and with a 50 percent quorum of voting membership as per the NCA Constitution (2014).